I spent several hours this weekend volunteering at the school my children attend. I worked a grocery booth where raffle tickets were sold and every ticket was a winner. The prize was some sort of grocery item either food or cleaning product. I was lucky enough to be set up next to a man who was raising money and looking for volunteers to help the local homeless. There are two reasons I was lucky. The first I was able to meet and talk with the man raising money for the homeless. After speaking with him for an hour off and on I decided to volunteer once a month at the soup kitchen. The other reason I was lucky is that I was able to see the generosity of the patrons. Many people simply donated their winnings from my booth directly to helping the homeless. As I continued our conversation we discussed the plight of the local homeless population. I live in the Northeast US and the cold weather is approaching. During the Great Depression many millions of Americans found themselves out of work, out of money, out of food and out of a home. Many people set up their own make shift little towns that were dubbed Hooverville’s, in dubious honor of President Herbert Hoover. Many of these towns were on someone else’s property, either public or private. These shanty towns were a means for those with the least to survive. The government did not want these shanty towns. The solution was to send in the army with Douglas MacArthur in charge. Yes that Douglas MacArthur. Unfortunately for our country not much has changed since then. Homelessness is ubiquitous in my city. People stand with their signs asking for help at the on and off ramps that lead to my city. It is heart breaking. Many are veterans some are just down on their luck. Generally speaking the police leave these people alone. But where do they sleep? There is a fence that separates a grocery store where I shop and some railroad tracks. Behind that fence the local homeless have set up a small tent city. The fence has a hole in it allowing people to easily slip back and forth through the fence and the stores. I was talking to the man next to me at the fundraiser about this enclave of homeless and he told me that not too long ago the police went and rousted the homeless from their little city. You see the tents are on railroad property. Since then I have seen very few homeless near the grocery store. I acknowledge that the homeless were squatting on private property. However, after rousting the homeless no action was taken to alleviate their plight. Why not? Well there is no plan to help the homeless. I have a plan. My city was crushed by the 2008 recession. There are abandoned homes throughout the city. These houses are boarded up and have been for years. I assume that some bank owns them. I believe that these homes should be opened up to the homeless. There would have to be an agreement with the banks either tax breaks or the outright purchase of these properties. Once situated in a stable spot the former homeless could begin to rebuild their lives. Whether they need help with addiction, mental illness or just a chance to climb out of abject despair there are state services and volunteers who could help. This plan is not my own. I learned about Seattle’s efforts to combat homelessness. The plan was housing first. As George Carlin said these people don’t need homes they need real tangible housing. You see you can’t get a job with no fixed address. Without housing first many homeless commit petty crimes so they can get locked up in jail where for a while they receive food, medication and a warm place to live. The cost to the state of incarcerating people who simply want to be warm and fed is high. Federal minimum security prison costs $20,000 per year per inmate. Using that as a baseline every homeless person who gets themselves locked up will cost the taxpayer say $5,000 per person. If fifty homeless people commit these petty crimes and get locked up the cost will be $250,000. That is enough money to purchase several boarded up three family homes in my city. Property values are in the tank right now. 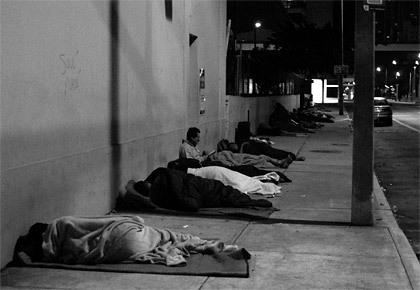 We need to treat homelessness as a social pox on our society instead of criminalizing people. Why must we prey on the weakest in society instead of assisting them? So I encourage you to donate and volunteer to help the homeless. Raise awareness and speak out against this terrible and fixable social evil in our country. We have made no real progress in this country since the 1930’s when MacArthur led troops to destroy Hooverville’s.